Why Is Lexus Incorporating Ancient Egyptian Symbols Into The LC 500? Look, Lexus. I know you think you’re getting away with something here, but I just want to let you know I know what you’re doing. You thought all us autojournos would be fooled — but you didn’t count on one with a mostly unused Art History degree and several semesters of Egyptology. I got your number, and I’m gonna blow the lid off this thing. Lexus has been getting more and more ornate, more baroque, with their car designs for a few years now. It started with the predator face, and went on from there, with special emphasis around the headlights, which were gaining odd LED strakes and slashes. At first, I just thought this was a clumsy design motif — now I see the end goal, and it’s terrifying. 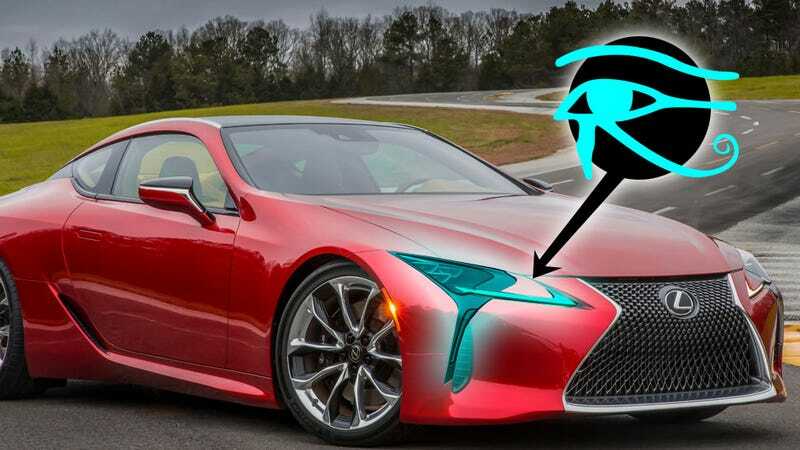 Lexus has turned their headlights into a pair of wedjat eyes. You probably know them as the Eye of Horus, which you may have seen carved into a sandstone relief containing the offering formula, or perhaps painted on the plaster coating of a sarcophagus, or maybe even on a young woman’s lower back. It doesn’t matter where you saw it before. What matters is where you see it now, in the headlight design of the Lexus LC 500. The Eye of Horus is a powerful protective symbol, and represents the eye of the god Horus that was injured in a fight with the god of chaos, Set. Why has Lexus chosen such a powerful amulet for the shape of their headlights? Why risk waking one of the Old Gods, and risk losing control of their will? Are they planning on using the protective powers of the Eye of Horus to replace a more expensive and complex radar-based emergency braking system? Are they deliberately invoking the wrath of Set, god of chaos and the desert, in hopes they can convince him to smite their enemies/Infiniti? Do they understand the forces they could awake? Is this a nod to a hidden Illuminati cabal? Are we safe? Are any of us safe anymore? Be wary. Keep your thoughts shielded, any way you can. Do not look directly into the headlights of a Lexus LC 500!